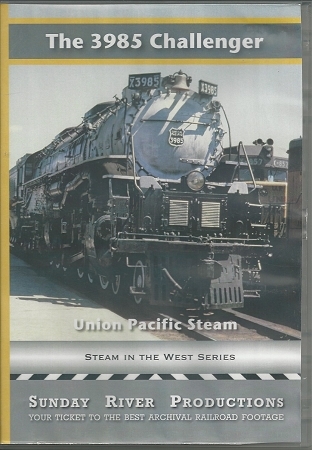 Highlights from the history of the 4-6-6-4 Challenger engines built by ALCO between 1936 and 1943. Take unique trips with 3985 the only Challenger still remaining in operation and one of the largest steam locomotives operating today. See early excursions after reconstruction in 1981 and pace her from the air as 3985 doubleheads with 8444 over Sherman Hill. The pair of engines crests Donner Pass deep in snow. Watch 3985_s first solo expedition across Wyoming and through the Bear River Range to Pocatello. Catch the first fan trip down the city streets of Salt Lake, south to Provo and experience breathtaking pacing against the Wasatch Range all white with winter. Bonus footage at the end shows 4-6-6-4s, a few 4-8-4s, and early diesels in the 1940s on the high Plains of Nebraska when Challengers did real work on the Union Pacific.